Merville was a small industrial town in northern France, close to the Belgian border. The town became the headquarters of the Indian Corps from September 1914 and the Lahore CCS was located there. Thrown into battle in September 1914 the Indian Divisions had helped halt the German advance in the Ypres Salient, sustaining heavy losses. George Wade was a mill warehouseman from Little Horton who served with 2nd West Yorks. At least 26 men from his Battalion died in 3 days of fighting at Neuve Chapelle. 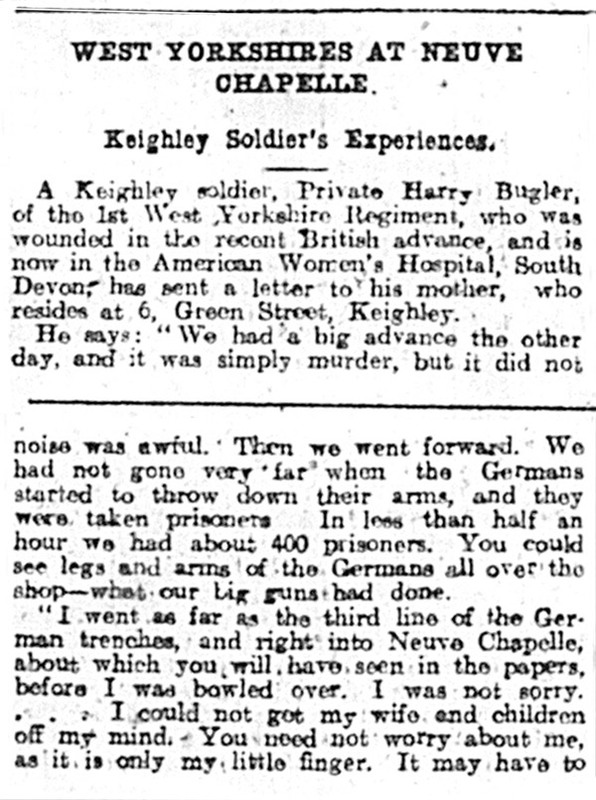 Pte Harry Bugler was wounded and discharged in May 1917 with a Silver War Badge. 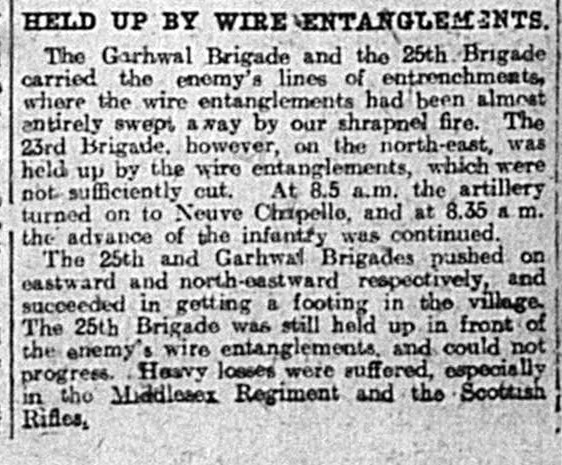 Bradford Weekly Telegraph, 16 April 1915 quoted from the Despatch from General French describing the participation of British and Indian troops at Neuve Chapelle. Near Merville in March 1915 they suffered similar losses at the Battle of Neuve Chapelle. A combination of a heavy bombardment with surprise had enabled them to break clean through the German lines (only one deep at this stage) although by the evening enemy reserves had come up and halted further progress. Losses were great on both sides with 20% of the Indian Corps strength being lost and even higher German losses. Men from Bradford, serving in Yorkshire Regiments also died in this battle. Amongst them were Privates Blamires and Baker. In letters home other men described the horrors of this battle. In April 1915 Merville was the first town of any size encountered by Bradford men from the 1/6th Battalion (the Bradford ‘Terriers’) and Neuve Chapelle their first encounter with the aftermath of battle. Their historian Captain Tempest wrote “the tide of the battle had flowed over the countryside and left its horrid debris everywhere”, leaving only one enduring memory: the Dead. Harold Burgess, age 17 and from Dover Street, Bradford, was one of the first men from the 1/6th Battn to die on 30 April. He is buried in the Merville Communal Cemetery where there are also buried 97 men of the Indian Army. 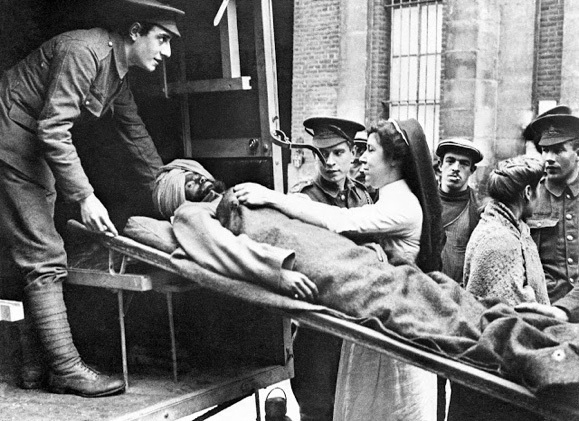 These include Partab Singh of 34th Sikh Pioneers died on 8 November 1914. He was the husband of Nandkamr from Ludhiana in the Punjab. Kale Khan from Alwar, (107th Indian Pioneers) and Lal Mast from Jamrud (57th Wildeís Rifles) both died in June 1915. 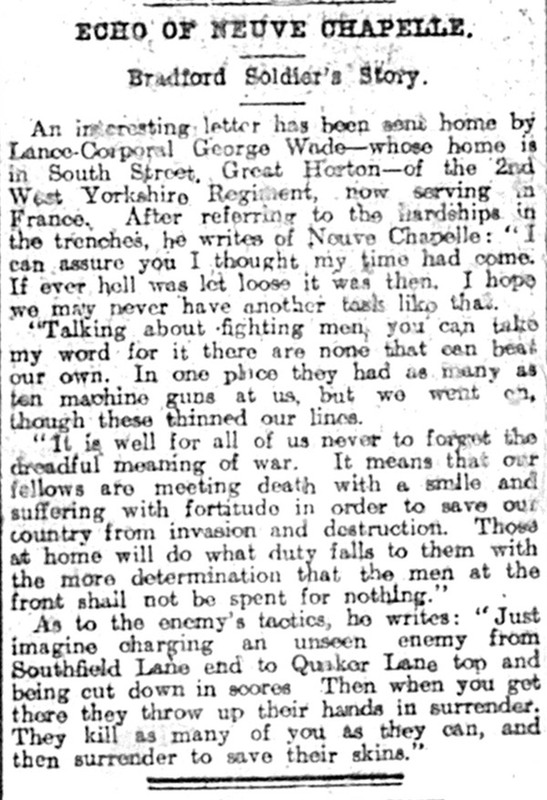 Captain Tempest praised the wonderful spirit of the Lahore Division as they left the Neuve Chapelle sector in April. The battle to which they were marching began on 22 April with a ferocious German attack north-east of Ypres, an attack of particular horror and significance as it was the first occasion on which gas was used. Between 26 April and 3 May the Lahore Division lost 3,889 men killed, wounded or missing. 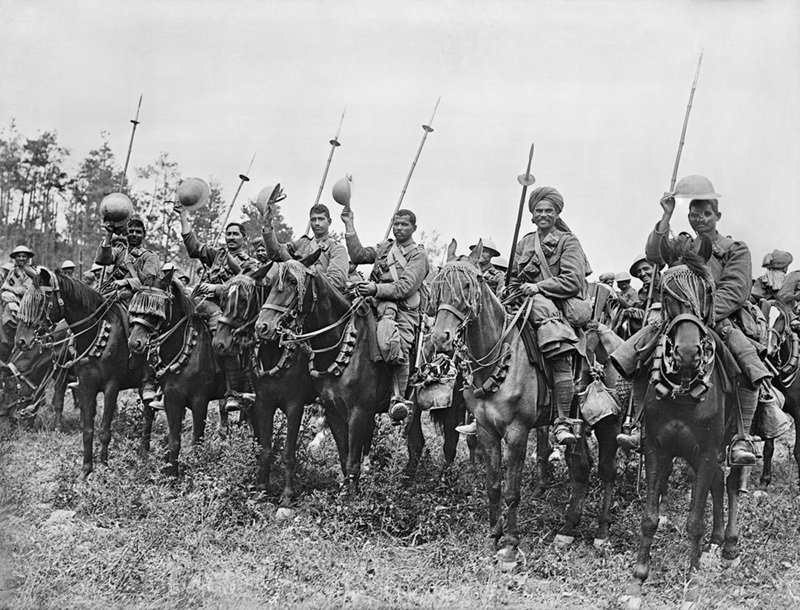 The Indian infantry Divisions were withdrawn from France by the end of 1915 to fight alongside the British in other theatres of war but the Indian cavalry remained, sometimes dismounted and being used as infantry. During the Battle of the Somme 20th Deccan Horse and 34th Poona Horse, along with the British 7th Dragoon Guards, mounted the first and only cavalry charge on 14 July 1916 during the assault on High Wood. Heavy German machine gun fire halted the charge but it was sufficient to stir the spirits of the hundreds of British troops who witnessed it. 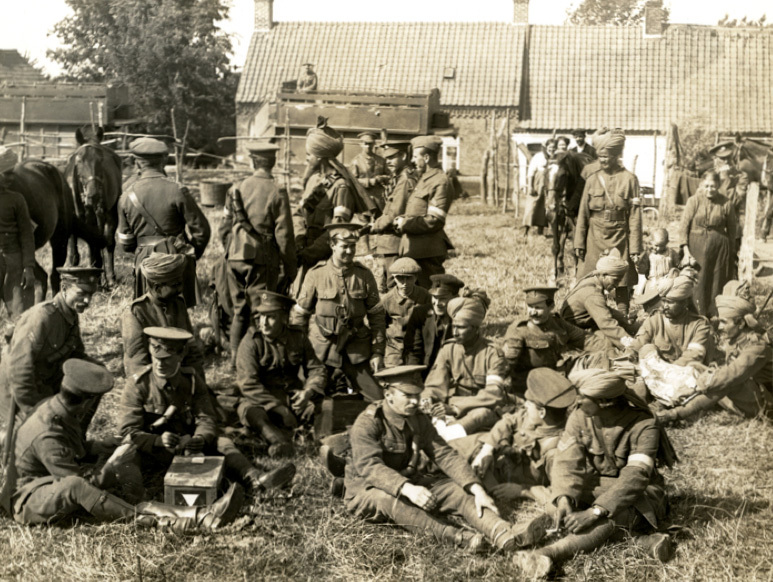 The 20th Deccan Horse, part of the 2nd Indian Cavalry Division, in Carnoy Valley shortly before their unsuccessful attack at High Wood on the evening of 14 July. Together with the 7th Dragoon guards, they suffered 102 casualties and lost 130 horses. 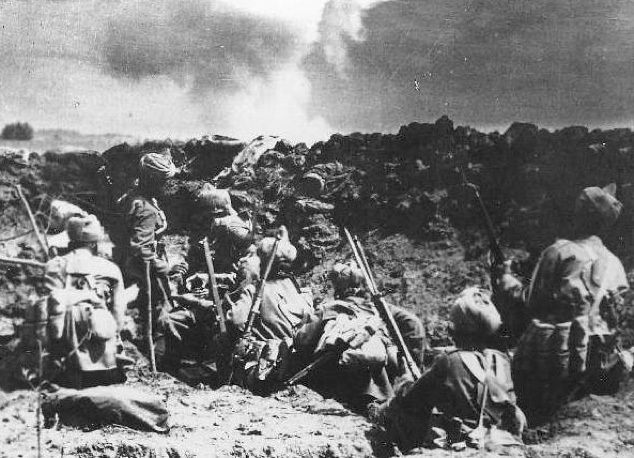 British and Indian soldiers behind the lines 1915. “Comrades France (Photo 24-158)” by H. D. Girdwood – This file has been provided by the British Library from its digital collections. English and Indian soldiers of the Signal Troop of the Lucknow Cavalry Brigade relaxing in a farmyard at Brigade Headquarters, 28 July 1915.